Welcome to Sasanian Persian Rugs. 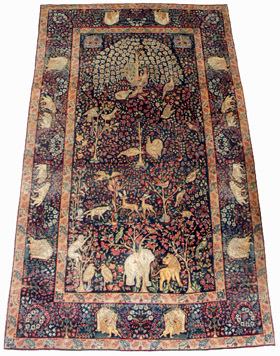 Please click on the Rug Gallery menu sections on this page to see a selection of our rugs and carpets. If you don't see what you want, please contact us - we have many more items in stock and may have just the thing you're looking for. We will be happy to discuss your requirements by email, by telephone or personally if you can visit us at our showroom in Southampton (click 'Contact us' on the menu for help on finding us).